The TPM (Trusted Platform Module) stores the private portion of a user's cryptography keys. 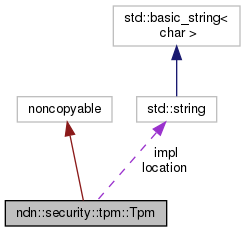 The format and location of stored information is indicated by the TpmLocator. The TPM is designed to work with a PIB (Public Information Base) which stores public keys and related information such as certificate. The TPM also provides functionalities of crypto transformation, such as signing and decryption. A TPM consists of a unified front-end interface and a back-end implementation. The front-end cache the handles of private keys which is provided by the back-end implementation. Tpm instance is created and managed only by v2::KeyChain. v2::KeyChain::getTpm() returns a const reference to the managed Tpm instance, through which it is possible to check existence of private keys, get public keys for the private keys, sign, and decrypt the supplied buffers using managed private keys. Definition at line 63 of file tpm.hpp. Definition at line 40 of file tpm.cpp. Check if a private key exists. Definition at line 46 of file tpm.cpp. The public key is in PKCS#8 format. Definition at line 79 of file tpm.cpp. Sign blob using the key with name keyName and using the digest digestAlgorithm. The signature, or nullptr if the key does not exist. Definition at line 90 of file tpm.cpp. Decrypt blob using the key with name keyName. The decrypted data, or nullptr if the key does not exist. Definition at line 101 of file tpm.cpp. Definition at line 112 of file tpm.cpp. When in terminal mode, the TPM will not ask user permission from GUI. Definition at line 118 of file tpm.cpp. true if the TPM is locked, otherwise false. Definition at line 124 of file tpm.cpp. password The password to unlock the TPM. Definition at line 130 of file tpm.cpp. Create key for identityName according to params. Tpm::Error the key already exists or params is invalid. Definition at line 52 of file tpm.cpp. References ndn::EC, ndn::KeyParams::getKeyType(), and ndn::RSA. Delete a key pair with name keyName. Definition at line 69 of file tpm.cpp. Export a private key in encrypted PKCS #8 format. The encoded private key wrapper. BackEnd::Error The key does not exist or it could not be exported. Definition at line 136 of file tpm.cpp. BackEnd::Error The key could not be imported. Definition at line 142 of file tpm.cpp. An empty cache can force Tpm to do key lookup in the back-end. Definition at line 203 of file tpm.hpp. Definition at line 225 of file tpm.hpp. Definition at line 150 of file tpm.hpp.